Patrick Ewing turned a dominant college career into an impressive NBA career, mainly with the New York Knicks, before retiring in 2002. Despite being one of the top players during the 1980's and 1990's, his certified autographs are limited. This relative rarity has made signed Patrick Ewing cards and memorabilia even more popular and valuable with collectors. 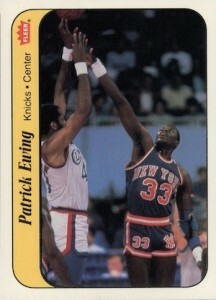 Shop for Patrick Ewing Cards on eBay. Patrick Ewing got an early cardboard start as regional cards were issued for his college team in all four seasons. From there, Ewing joined the NBA in time to be included in 1986-87 Fleer. 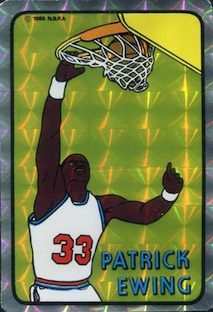 Given the period that his career covered, a wide variety of Patrick Ewing cards were produced, including the overproduction period of the late-80's and early-90's, as well as the innovation and inserts that came in the late-1990's. The one lacking area in his card database is certified autographs. Outside of two early releases during his playing days, the majority of Patrick Ewing autographed cards are found in 2003-04 Upper Deck products and a limited run in 2012-13 Leaf Metal. Be aware that his son, Patrick Ewing Jr., also played in the NBA, and has signed cards available. Similar to his signed basketball cards, autographed Patrick Ewing memorabilia is not in great supply. As an infrequent signer, Patrick Ewing collectors don't have the same options as they would for many other former players. 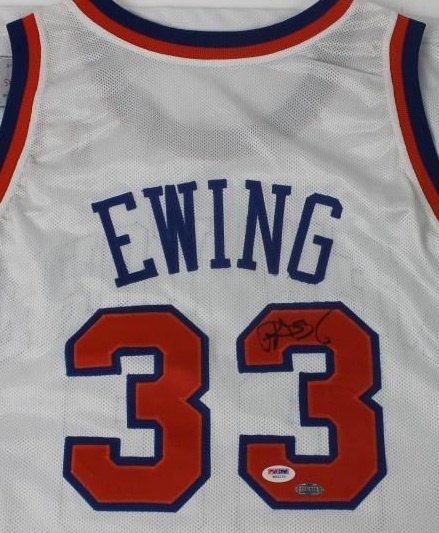 However, collectors can still find signed Patrick Ewing gear. The list below documents the key early Patrick Ewing cards and his sole rookie card. 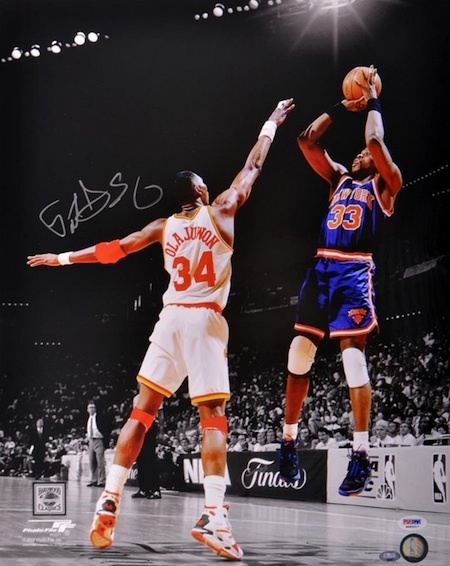 The following tab includes an autographed memorabilia guide for Patrick Ewing and a buying guide. 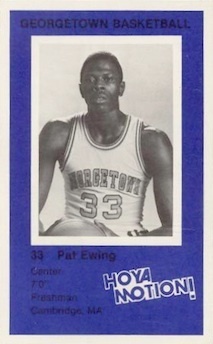 Available for his entire collegiate career, these Patrick Ewing cards cover his time with the Georgetown Hoyas. The cards were sponsored by the DC Police Department and the card from his first season has proven to be the most valuable. Slightly taller than the average card (2-5/8" x 4-1/8"), the card showcases a vivd blue color and is offset by a black-and-white image of a very skinny Patrick Ewing. The card back even offers a basketball-themed life lesson - "A foul in life can lead to arrest. Don't foul your future." The first overall pick in 1985, Patrick Ewing was a star even before he suited up for the Knicks. Due to this, unlicensed cards like this 1985 Prism Jewel Sticker release were issued. The cards maintain decent interest today and the technology included in the colorful card was clearly ahead of its time. 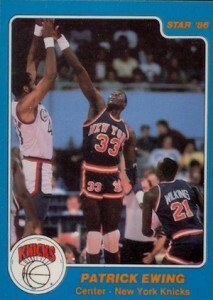 As the first NBA licensed card for Patrick Ewing, this 1985-86 Star Company remains popular with collectors. 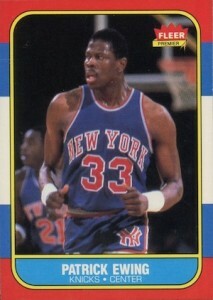 Some collectors consider this to be Patrick Ewing's true rookie card. Coming a year after his debut in the league, the official Patrick Ewing rookie card is found in 1986-87 Fleer. Ungraded card prices remain reasonable and there is also a sticker insert available for Ewing. 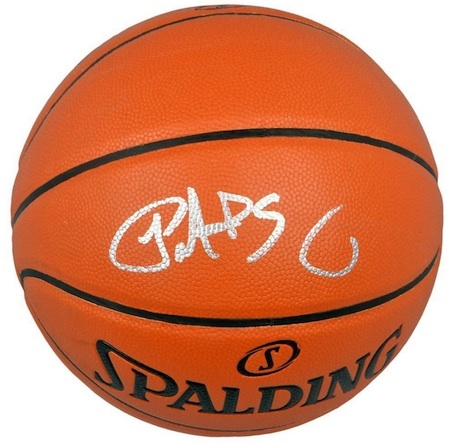 Below you will find an example of what Patrick Ewing's authentic signature looks like. This can be used as a first point of reference for determining the legitimacy of autograph memorabilia, but is not a substitute for having your items authenticated by a well-respected professional autograph authentication company. Reputable authentication companies include JSA, PSA, Panini Authentic and Mounted Memories, to name a few. There is no way around it. Patrick Ewing's signature leaves much to be desired and is not very consistent. The opening "P" resembles a "G" with the top continuing around in to the letter. Next comes what appears to be "A-P-S" and lastly something that looks like a 6. Occasionally, his number (33) is legible at the end. VINTAGE Patrick Ewing NO 33 Signed Autographed Basketball 8x10 Photo JSA AH LOA! 1988 Fleer 80 Patrick Ewing PSA 9 MINT! !